Lifelong poet Jessica Metcalf presents her first collection of poetry into the world of literature, and hopes to touch the hearts and minds of readers everywhere. 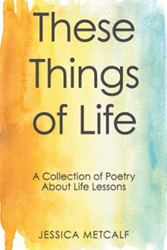 This debut book titled “These Things of Life” (published by AuthorHouse UK) is a culmination of her writings over the course of many years detailing experiences and feelings that readers can share and enjoy. Those who would like to purchase and know more about the book may visit https://www.authorhouse.co.uk/Bookstore/BookDetail.aspx?BookId=SKU-001173900. In this collection, the author discusses her journey to understanding people, relationships and life in general. In here, she shares a poetic account of her personal thoughts, experiences and feelings, which touches on themes such as insecurities, failures, friendships, loss, anger, happiness and of finding joy in nature and in the simplest of things. Blending simplicity and depth, Metcalf writes about subjects that people are facing internally and externally with a unique rhyme scheme and beat. “Not only is it enjoyable in its singsong style, but it also is very understandable with a deep meaning,” she asserts. Jessica Metcalf was born in Hartford, Connecticut, in 1976. She started writing poetry when she was able to write, creating poems for family and loved ones. She is an English teacher at Salisbury School in Salisbury, Connecticut, and has been in the line of education since 1999. She is married and has four children.